Gravity (2013) Directed by:Alfonso Cuarón Written by: Alfonso Cuarón, Jonás Cuarón (screenplay) Stars: Sandra Bullock, George Clooney, Ed Harris Runtime: 90 min. Rated PG (Canada) PG-13 (MPAA) for intense perilous sequences, some disturbing images and brief strong language. Setting his film against the stars and the breathtaking beauty of earth from orbit, Alfonso Cuarón provides a vision of the heavens in Gravitythat has been generally received as scientifically accurate not to mention visually arresting. Gravityis a science fiction movie, not a science fiction fantasy movie. There are no lightsabres, phasers or googly-eyed aliens and after the first 20 minutes there is just a man and a woman orbiting the earth in the cold, silent vastness of space. Eventually Gravity becomes the story of a single person isolated in the heavens. The sheer grandeur and awe-inspiring vision of space in the film’s opening moments may remind Christians of Psalm 8 where the Psalmist writes, "When I look at Your heavens, the work of Your fingers, the moon and the stars, which You have set in place, what is man that You are mindful of him, and the son of man that You care for him?" Is there anything spiritual to consider in Gravity? Yes. God and spirituality play a part. The story is set sometime in the future but not too far into the future. The world still has countries and their various national space stations show signs of faith. The Russian space station has an orthodox prayer card featuring an icon of St. Christopher carrying a child on his shoulders and the Chinese space station has a bodhisattva, a Buddhist symbol of good fortune, joy, abundance, and contentment. Interestingly in the more mono-culturalwestern ISS the only small 'votive' object shown is a Marvin the Martian collectable model floating out of a busted window. Why are these objects important and how do they connect with God, spirituality, and the story told in Gravity? Just like in daily life these kinds of objects function on two levels: the material and the symbolic. The writer’s use of these objects helps bring together these two elements of Gravity’s story. The film’s central character is bio-medical engineer Dr. Ryan Stone (Sandra Bullock ) a mission specialist working on the Hubble Space Telescope when a disaster causes space debris to jeopardise the mission leaving her and veteran astronaut, Matt Kowalski (George Clooney), scrambling for survival. This sets into motion two storylines: the external thriller storyline of survival in a hostile environment where death is present at every turn and an internal storyline where Dr. Stone struggles to come to terms with her mortality and personal grief at the loss of her daughter as she contemplates life, death and possibly even eternal life in the face of imminent death. Her daughter’s accidental death happens before the events of the film and is revealed in dialogue. This grief drives Dr. Stone's actions at every turn. Marvin the Martian, St. Christopher, and the Bodhisattva provide a concrete jumping-off point for thinking about the internal story of spiritual odyssey that director Cuarón is telling. These objects act as sign posts along the path of Dr. Stone's existential story. Thinking about all three helps define the internal story that runs alongside the external space survival thriller. Dressed like the pagan Roman god Mars, Marvin the Martian is a Warner Bros. cartoon villain, a space alien bent on destruction and who spends most of his time looking through a giant telescope. 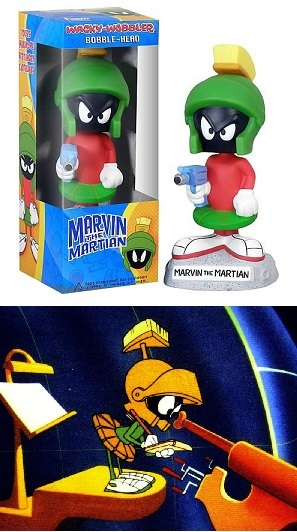 Preoccupied with his work, Marvin the Martian is mild-mannered yet very dangerous. Outside of the character himself, Marvin the Martian is also an icon of American consumer culture. This is not a child's toy; it's an object made primarily for adults and can easily serve as a symbol of perpetual childhood and nostalgia. This becomes clearer as the plot of Gravity unfolds. The object marks the beginning of Stone’s movement from materialism to spirituality. Because of the disaster at hand she is also forced to move from looking backwards in life to looking forward; forced to grow up in the face of tragedies both past and present. Her material cultural ideals, in the face of certain death, are “floating outside the busted window” just like the collectable model of Marvin the Martian. And thus begins her struggle with what that means: staying in orbit with Marvin the Martian would bring about her death. The second symbol is the Orthodox prayer card of Saint Christopher. In some traditions St. Christopher is the patron saint of travellers and in Gravity this also becomes an image of seeking and finding as Dr. Stone continues travelling on her path. Christopher lived in the 3rd century and the first part of the main story with which he is associated is about him seeking to serve the greatest king there was to serve. In his seeking he finds Christ and becomes a Christian. 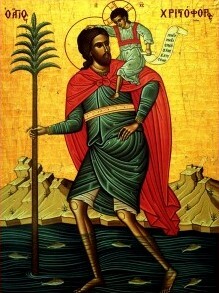 The image of him carrying a small child across the water is significant because in the legend of St. Christopher that child turns out to be the baby Jesus. When the physically powerful Christopher complains about the weight of the small child he is carrying and the danger he finds himself in because of the weight, the child reveals Himself to be the Christ by saying, "You had on your shoulders not only the whole world but Him who made it. I am Christ your king, whom you are serving by this work." Dr. Stone is carrying a child on her back too — the child she lost, the child who died. And the weight of her grief is as heavy as the earth she's orbiting. In her internal story she must come to terms with the weight of grief before she can return to earth. There is more to this than just the story of St. Christopher in relation to Dr. Stone. In many Christian traditions prayer cards are used to teach Christians how to pray and to keep the practice of prayer before their eyes. This too is part of the building internal story. 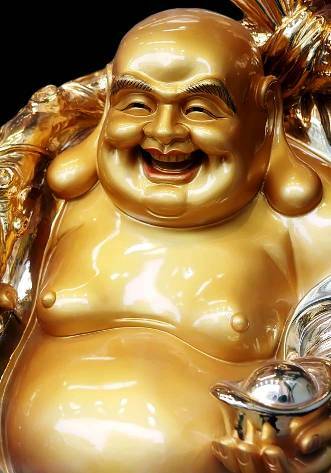 The last of these obvious symbolic objects is the Bodhisattva — a fat little character which is a staple symbol in Buddhism and symbolizes good fortune, joy, abundance, and contentment. These are all things Dr. Stone is in dire need of, things she lost in the death of her daughter and in the tragic accident that's left her stranded in orbit. While on the Chinese space station a glimmer of hope emerges as Stone makes radio contact with someone on earth. Unfortunately, it's a one-way communication and she can't really speak with them. In the midst of all this,over the radio she hears the sound of a baby. Stone starts talking out loud to herself and all the threads of these symbolic objects and her internal story come together as she laments, “No one will mourn for me ... No one will pray for my soul. … I’ve never prayed. … Nobody has taught me how. …” This is not an angry statement, it's desperation and sadness lined with fear. She's deeply contemplating the nature of existence and her place in it. She is left to face the prospect of travelling forward or laying down and dying because there's no reason to continue. Christians are left to ask: who is she talking too? Is she talking to herself? Is she talking to God? Is Cuarón using her voice to talk to the viewer? Is it all of these things at once? These three objects used to tell Dr. Stone’s internal story aren't all Christian objects and the film’s presentation of spirituality isn't rooted specifically in western Christianity. While it contains Christian elements it’s more grounded in a generic pop-spirituality than in materialism, Christianity, or Buddhism. Christianity is but one sign-post along the path to 'enlightenment'. When considering all of this viewers could possibly be left to ask: Who is this film made for? As actors Clooney and Bullock are both baby-boomers. Do they represent that demographic? Is this the target audience or is there a target audience at all? As a generation baby-boomers were taught to pray, but many in North America rebelled against religious institutions and embraced instead the institutions of either commercial materialism and/or scientific materialism. Is Gravity then social commentary setting up a dichotomy between materialism and spirituality? Or is Gravity made with the segment of the population in mind who have never had a religious affiliation—a demographic of people who were not taught to pray in a spiritual setting, in an educational setting or in a home setting? Perhaps the best question to ask is, "What does the internal storyline of Dr. Stone say to me as a viewer?" "Life in space is impossible,"
The film opens with the words: "Life in space is impossible." For the character of Dr. Stone, when all her safety nets of technology begin failing, it is her personal will that is necessary to live. That will engages in a struggle between the material and the spiritual. In very visual ways this internal odyssey she is embarked on is a re-birth. At one point Stone is even shown floating in an embryonic fetal position. For Christians there is a significant teaching of the faith that corresponds to being re-born: Jesus responding to a man of the Pharisees named Nicodemus, said “Truly, truly, I say to you, unless one is born again he cannot see the kingdom of God.” Nicodemus said to Him, “How can a man be born when he is old? Can he enter a second time into his mother's womb and be born?” Jesus answered, “Truly, truly, I say to you, unless one is born of water and the Spirit, he cannot enter the kingdom of God. That which is born of the flesh is flesh, and that which is born of the Spirit is spirit. Do not marvel that I said to you, ‘You must be born again.’ The wind blows where it wishes, and you hear its sound, but you do not know where it comes from or where it goes. So it is with everyone who is born of the Spirit.” Being born again within a Christian context comes from outside of a person and re-birth is not an internal odyssey. Being born again, historically and contemporarily, is part of the Sacrament of Holy Baptism. For Christians, life and eternal life are only possible in Christ Jesus. 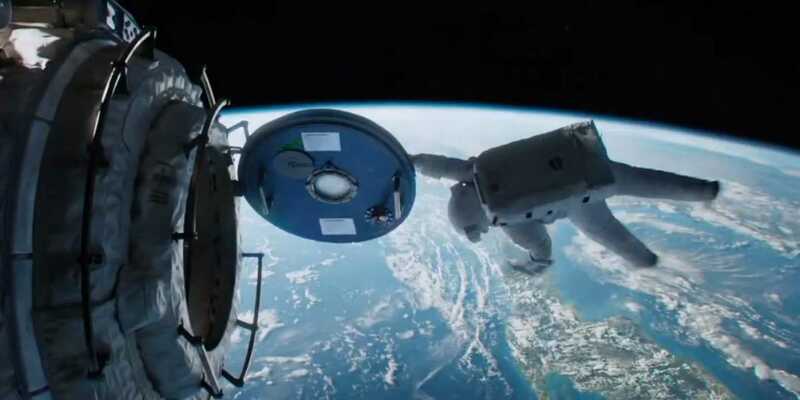 Gravity is a beautifully made film and in its brief 90 minutes accomplishes much. The external thriller element of the film is well done and will keep audiences on the edge of their seats. The remarkable visuals will amaze viewers for years to come and the internal story of Dr. Stone provides an opportunity for introspection concerning personal spiritual convictions. Will it lead people to learn to pray or to teach others to pray? It's hard to say, but when it comes to science-fiction Gravity is a compelling film for Christians to watch because it addresses the very real nature of humans—we are more than bodies. The human also has something else: a mind, a soul, a spirit, a heart, a will and this doesn't change when a story is set in the future. In life this combination of body and soul come into play in the face of grief and tragedy. On some level everyone knows that these things working together are necessary for survival: This is what makes Gravity both a simple and compelling story that is elegant in its execution. The Christian will know that prayer is essential in the midst of grief and adversity, and not just prayer in general, not a vague hodgepodge of spirituality, but prayer to someone specific, prayer to the One who made the Earth and the universe with its stars, prayer to the One who is mindful of a person even when they are all alone and isolated in their trouble. Tears in space don't work like they do in the film and hair also reacts differently to zero gravity than the film depicts.